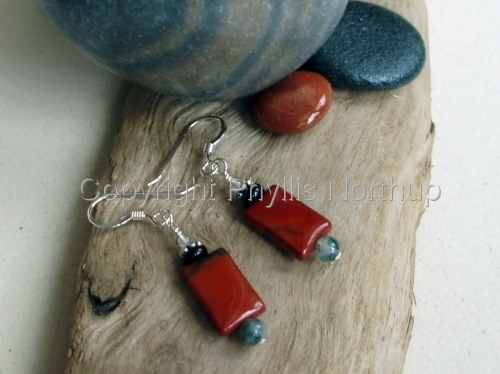 The red jasper stones always catch my eye when I am walking along our Lake Superior beaches. Their deep red color really stands out among the more subtle variations of rock colors. Red jasper is the dominant stone in these earrings, with accents of moss agate, onyx, quartz, sterling daisy spacers, and finished with sterling ear wires. Earrings are displayed on a hand painted lakescape card. Price includes shipping.